Size: 6.5" x 3.5" x 0.2"
The TimeRunner series of Organizers were introduced already in 1993 and far ahead the competition. With the slim housing measuring only 0.2 inch they fitted perfectly in a Day Runner system including a calendar, Today pages and tabs for notes, meetings and finances. The book was refillable with the "Day Runner Running Mate Edition" refills. The display of the TimeRunner is very useful supporting 6 lines by 24 characters. The language of the menues could be choosen between five languages: French, English, German, Italian and Spanish. The PS-9450 TimeRunner uses 32k Byte memory instead the 64k Bytes. In Europe a very similar product was sold as IS-8400. Don't miss the ACADEMY 101, Franklin Quest's edition of the PS-9500 and the DAY RUNNER based on the PS-2100. Texas Instruments Inc reckons that it has a new twist for the handheld electronic organiser market - paper: it is joining forces with Fullerton, California-based Day Runner Inc to create a line of products that will combine "the most popular features of electronic and paper-based organisers". Each will integrate electronics and paper to increase versatility. Day Runner specialises in paper-based organisers. Prototypes will be shown in August with first products to hit the market before the end of the year. 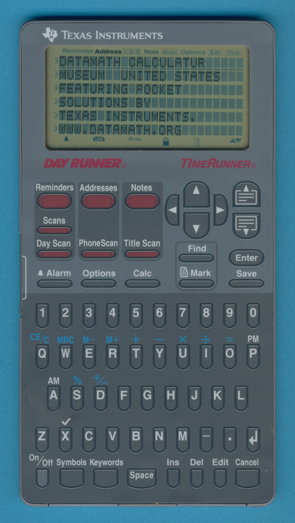 The TimeRunner PS-9500 is featured in the Texas Instruments Incorporated sales catalog CL-1233 dated 1994.